Few break through to the other side, creating an automated income stream that works while you sleep, pick up the kids, or while traveling. There are many ways to make money with your blog. You can put ads on your site or even sell your own products. But, two of the most common ways to make money as a new or established blogger, is through affiliate marketing and sponsorships. Why? Affiliate marketing allows you to earn high margins on product sales with established companies, without having to handle any of the fulfillment. Along with the opportunity to easily make money with affiliate marketing and sponsorships, come many questions about what you can and cannot do in terms of the law. As a former practicing lawyer for eight years, I know how hard it can be to understand legal jargon. My intention with this post is to help clarify some of the gray areas in this relatively new territory. Once you understand basic rules of the road, you will feel empowered and can steer clear of any issues and be on your way to living the dream. In many ways, the law hasn’t quite figured out what bloggers are. In some circumstances, they are journalists. Sometimes bloggers are just hobbyists, chronicling their lives and passions for the world to see. But, some bloggers, and this most likely includes you, are considered businesses. If you make or are trying to generate money from your blog, the law views you as a business. You are a business even if you don’t sell any products or services. If you have ads on your site, you use affiliate links, or you have sponsored posts on your site, you are a business. Being a business can be great. You have the tax advantages open to all small businesses. You are part of a developing economy that is creating new wealth for people all over the world. But, being a business also comes with responsibilities. Various state and federal laws make it illegal to run a business that’s purpose is to lie to its customers. Being a business, you have a higher duty of honesty and transparency than someone putting up reviews of last night’s episode of Grey’s Anatomy. If you want to avoid trouble with the law, you need to be honest with your customers. The primary federal agency that regulates bloggers is the Federal Trade Commission (FTC). The FTC watches all businesses, not just bloggers. They want to make sure that nobody is profiting from false claims. They also require transparency with how you are making your money. Their job is stop fraud. The FTC wants you to tell people when they click on one of your affiliate links and buy a product that you are getting money. To avoid your customers thinking you are an unbiased source of information. Most of you would publish content endorsing products whether you get paid as an affiliate or not. But, the FTC knows some people are not that ethical. If you want to keep the FTC happy and keep your platform transparent to your audience you need to tell people when a link is an affiliate link or when you publish sponsored content. The FTC calls these statements disclosures. A disclosure doesn’t require jargon and legalese. It’s best if your disclosures are simple, short truthful statements. While the web is still the Wild West in many ways, the FTC is striving to bring law and order. And the last thing you want is for them to make an example out of you. Their biggest weapon is imposing a fine. In 2009, the FTC set out guidelines for disclosures and consequences for failing to use them. If a blog post or social media post does not accurately disclose the sponsorship, both the blogger and the sponsor can receive fines. If you receive money, products, or services in exchange for a post about the company or its products or services. Review a product or service that comes from an advertiser on your site. The single most valuable asset to any blogger is his or her credibility. Once your audience believes in you, you create influence and can build a profitable business. But, for any reason your credibility is in question, it’s tough to get it back and losing credibility can cost you your business. Sponsored content is when a third party pays you to write content about their product or service for your site. You have to tell people when you are being paid for a post like this. That doesn’t mean you have to have red flashing lights and a pop-up warning, but it does mean you need a disclosure or signal that the content is more than just your opinion. You can create a tag and blog category for your post called “sponsored.” But, this alone is not enough to keep your reputation with your audience. The FTC requires a disclosure statement in each piece sponsored content or in any content containing affiliate links. At the beginning or end of the post, you should have a short statement. This is a sponsored post. I have been paid by ____ to write a post explaining to you why they are such a great company. I never accept sponsored posts from anyone I have not used before. I love the service ____ provides and am happy to tell you more about how they have helped me. This is a sponsored post. I was lucky enough to get paid to write about a product I already use and love. I never accept sponsors I do not 100% believe in. I was paid to write this article. Sponsors help keep this blog up and running. I never accept sponsors I don’t believe in. My rule is I don’t accept sponsors unless I would write the same thing for free. The most common type of sponsored post is a paid review. In 2011, the FTC imposed a $250,000 fine on the company Legacy Learning for a series of actions where it paid people to review its products and generated income from non-disclosed affiliate links. The most critical elements are to signal to the audience that the content is sponsored and explain your philosophy about sponsors to your audience. The FTC requires that the disclosure is obvious and clear. That shouldn’t be a problem because you want your audience to know what is going on. Before you decide to use an affiliate link always ask yourself how you would feel if you saw that link on your favorite blog. If it would make you feel funny or angry, don’t use the link on your site. But, if you would click on the link because the product makes you excited, use the link. You aren’t being a scammer, you are being helpful and deserve compensation. Many bloggers worry that by having a disclosure their audience will feel scammed and will leave the site and never come back. While some people will always react negatively to anyone trying to earn a living, most understand that you are not selling out; you are just trying to build something great. Some people are afraid that if they know you are making money in the arrangement, that people won’t buy through your affiliate link. This is the opposite if you frame it correctly. In 2013, Author and Blogger Jonathan Fields conducted an experiment with a video promoting a third party digital product. He gave the readers two links to visit the website of the product, disclosing one link as an affiliate link and one as a non-affiliate link. The results showed 76% of the readers clicked the clearly labeled affiliate link. When asked why they chose the link that they did, the comments posted from his community were quite interesting. Most people were just happy to support. Several people who clicked the non-affiliate link remarked that they had no intention to buy the product, which is why they clicked the direct link. Either way, this is proof that people are likely not going to care if you make money on products, as long as you invest into building trust first. If you want to use a disclosure that covers you legally and keeps your audience happy, keep it short and simple. This content contains affiliate links. When you click on a link and buy a product I get a commission. I never link to anything that I don’t think is perfect for you and that I wouldn’t recommend even if I wasn’t getting paid. This post may contain affiliate links. If you click the link and make a purchase I get a small commission to help me keep this blog running. This article contains affiliate links. When you make a purchase from the link I get a commission. The disclosure can be put at the top or bottom of the post. You know your audience, write a disclosure that speaks to them. Most people will think better of you for being transparent and will trust you even more once they see your disclosure. You need some type of disclosure for every post that contains affiliate links. While this was once a gray area, the FTC requires that disclosures be obvious and as close the actual advertising (or affiliate link) as practical. Having it in the actual post is what the FTC prefers. If you have a footer that is the same for every post that has the disclosure information or a link to the disclosure information, that may work. But it will depend on how easy it is to find the footer and how easy it is to read. The FTC is trying to discourage “fine print” disclosures that are hard to read and understand. This is an example of how to use a footer for your affiliate disclosure. Notice it clearly says affiliate disclosure. 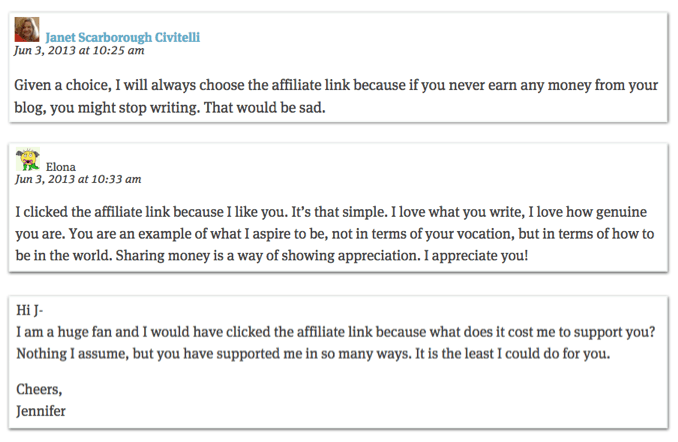 If you click on the words “Affiliate Disclosure” you are taken to a great explanation of her how she uses affiliate links that informs and builds trust. She even uses her affiliate disclosure page as an opportunity to link out to affiliate products and popular blogs posts that produce affiliate sales for her. 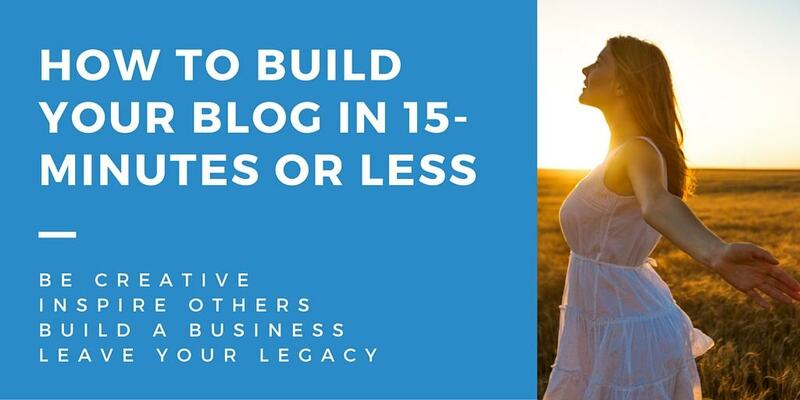 Blogger Carrie Rocha at Pocket Your Dollars uses a short sentence under the title of each post that links to her much longer policy. This is an example of adding a short sentence to each post with a link to more information. If you produce ebooks you can use the same type of disclosure in the Introduction. When using affiliate links limit yourself to a small number of links. The more links you have the more desperate you look to make money. Nobody likes desperation. They can smell it through the computer screen and will leave your site. Only use the bare essential number of affiliate links to really great products. Just like you can only make so many recommendations to your friends before you don’t get invited to coffee anymore, your blog audience only needs a few of your suggestions for purchases at a time. If you recommend your audience buy great products that make their life better, not only will you make more money, but also you will build up more trust. The more your audience trusts you the easier it will be to find new ways to monetize. But, the second you lose their trust you also lose any chance at building a sustainable blog-based business. You should never accept a sponsor that isn’t 100% in tune with your values and the mission of your site. You are putting your credibility on the line every time you have a sponsor. If the product or service isn’t something you would feel comfortable recommending to your mother or best friend, turn the sponsor away. It can take years to build up authority and credibility with an audience. But, it only takes one post to ruin it. Even if a sponsor is in line with your values and mission, you may still want to decline if it will distract for your long-term goals. If you plan on developing your own products or services, sponsored content may distract and compete with your future plans. One trigger of big FTC fines is misleading content. This includes recommending a product you have never tried, but making it seem like you have or making false claims about the features or benefits of the product. Most of this post has been dedicated to sponsors and affiliate links. But, another way some bloggers monetize their site is through ads. Ads are different from sponsors and affiliates in that you do not need a disclosure so long as it is clear what is an ad and what is the content. Most ads are obvious and many even have “ad” or “advertisement” in tiny letters around the frame. The FTC and the law treat advertising differently because there is an understanding that the content provider is not standing behind the ad content in the same way. However, remember the goal is not to just obey the law, but to build trust with your audience. Advertising may sometimes be legal, but interfere with the relationship you have with your audience. Your job is to eliminate anything that interferes with that relationship. The FTC does require that you disclose any other benefits you are getting from your advertisers beyond paying for the ad. If an advertiser pays for you to attend a conference and you then blog about the conference, you need to disclose how your trip was funded. If your focus is always on transparency and keeping the trust of your audience, you won’t have to worry about the FTC because you will naturally follow the guidelines. Much of the marketing for blogs is done with social media. The FTC has recently updated its FAQ about the standards for Internet marketers using social media. The update is not very specific on what it would like to see. But, the main message seems to be endorsement or sponsorship relationships need to be disclosed even on social media. This can be problematic, especially on platforms like Twitter where you only have 140 characters to communicate. Using a hashtag such as #ad or #sponsored or #affiliate can help make it clear that a social media update is not just you passing on a friendly idea. Shortening the hashtag to #spon or #aff probably isn’t clear enough and would be frowned on by the FTC. The more you are on the web the more clear it is that most scammers and spammers are not being dealt with. Even though the FTC would be hard pressed to take down even a fraction of the fraud on the web, you do not want to do anything that will risk your customer’s trust or run the risk, even if it is small, of legal action. The smart way to introduce affiliate links into your content is to focus on transparency. If you don’t have a massive following on your blog of people who trust you, you can work towards that by being honest in with your disclosures. Tell people it’s an affiliate link. Your community will gladly support you when you put in the work to establish trust with them. 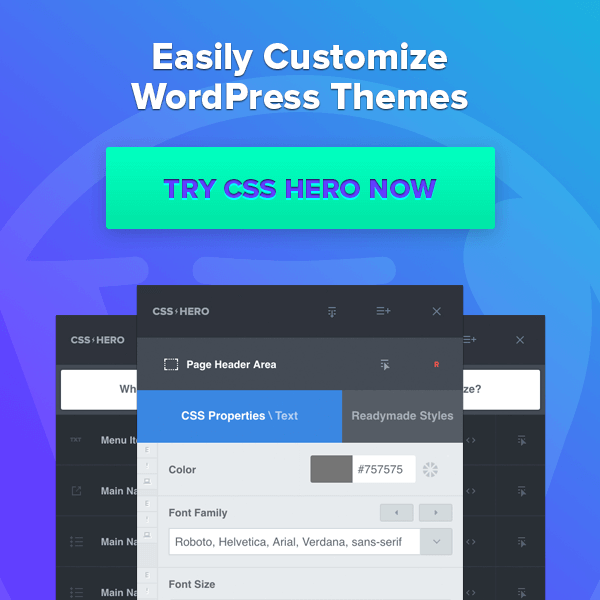 As you can see in the screenshot below, a member from the Learn To Blog community specifically requested to use an affiliate link in order to purchase the WordPress theme DIVI. If someone reviews a product and you get value from it and they don’t give an affiliate link, reach out to them and ask them for one. It’s a great way to build goodwill with someone and it doesn’t cost you anything. You will succeed faster if your primary focus is on building trust and authority instead of making money. The money will come after you have put in the work. This approach also keeps you on the right side of the law every time. QUESTION: Have you ever made an affiliate sale online? If so, what is the backstory behind your first ever online sale? What was it? How did you feel when you made that sale? We’d love it if you shared your story with our community, as it may just inspire someone here. If you haven’t made a sale online, what is your biggest challenge with affiliate marketing? Let me know in the comments below so we can have a discussion. Jason is passionate about helping others find success in using the power of the web to build their businesses. He is a former practicing attorney who quit the rat race to follow his love of writing and marketing. Jason can be found at his site Client Magnet Marketing.